This is a dram that I have enjoyed since it’s release, now is the time to do a tasting and a wee review. The Glen Moray Distillery sits on the banks of the River Lossie in the heart of Speyside. Check out their website www.glenmoray.com for details on tour guides and their fabulous range of single malts. From this list there is a dram for everyone. I have used the 10 Year Old Chardonnay Cask in many tastings where some of the tasters are new to Whisky and this light, sweet, woody and fruity gem is a great introduction to Single Malts. Lets open the bottle and have a wee taste. 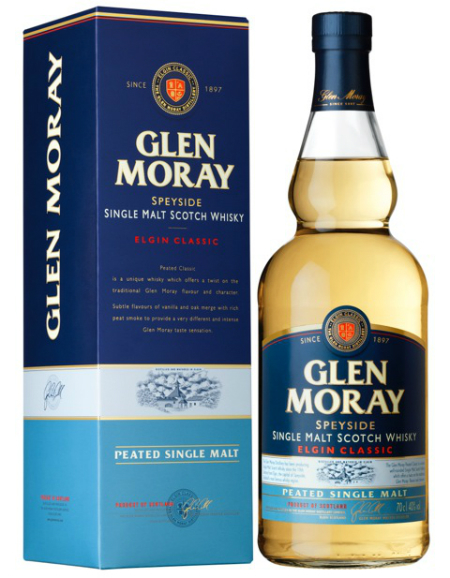 Glen Moray Elgin Classic Peated – Speyside Single Malt Scotch Whisky, Unaged, 40% Alc/vol 70 cl. Nose: A sweet smoke hits the nose first, singed oak, but a sweetness tickles the nose. Taste: The peat smoke is king here, there is also a fresh generic sweetness, seared gammon steak straight off the BBQ, for a peated dram this one is quite easy on the palate. Finish: A medium finish with the peat smoke lingering gentle all aver the mouth and tongue, sweet oak pops up. A very easy going peated dram, at around £25.00 for a bottle this one will not break the bank. This one is an every day dram which is quite unusual for a peaty / smoky Malt, heavier peated malts sometimes have to be taken in moderation. This bottle together with the 10 Year Old Chardonnay Cask are always on offer in The Whisky Boys Whisky Cabin. The three Classic bottles are very readily available in many supermarkets and certainly in specialist Whisky shops or on line via our Whisky Shop. 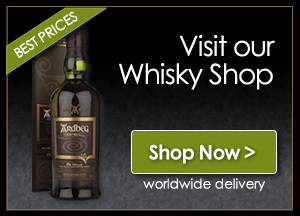 So all you peat/smoky dram lovers do not be put off by the very affordable price, please buy a bottle and enjoy, my wee tip is to only add a little water and you will have dram to delight you. Well done to the guys and gals up in Elgin here is hoping that we might see in the future an aged cask strength peated version, that’s on my Whisky wish list.